Audiobooks are fun experiences on their own and are a great way to experience a book in a different way. Not all books make for great audiobooks and vice versa. But beyond audiobooks are the related entertainment form in terms of radio plays and other such recorded dramas. Big Finish has made a name for itself as a passionate producer of such original audio content with a lot of work invested in the Doctor Who franchise. And it's nice to see that some of their efforts have made their way to Audible and thus I'm now able to use my credits to get my "hands" on some of these excellent Big Finish productions. And of course I had to star with the Tenth Doctor's stories because I'm pretty predictable as a Doctor Who fan. 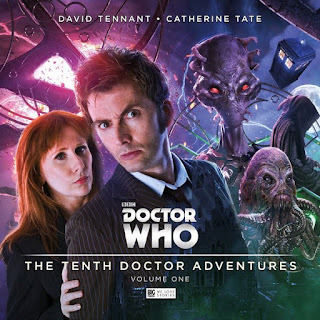 Synopsis: Doctor Who: The Tenth Doctor Adventures- Volume One is a collection of three audio dramas created by Big Finish Productions. This review covers the Audible audio release of this compilation with David Tennant reprising his role as the Doctor and Catherine Tate as Donna Noble along with other voice talent. In Technophobia (written by Matt Fitton), we encounter a world where one of the smartest computer people in the world suddenly finds herself no longer able to operate technology. And gradual fear of technology spreads from person to person leaving the Doctor and Donna possibly the only ones who can figure things out and stop the planet from falling into alien hands. Time Reaver (written by Jenny T Colgan) has the Doctor and Donna taking a detour to Calibris, a planet where anyone can get their hands on just about anything for the right price. They they stumble across an illegal time weapon somehow being in the open and the Doctor can't possibly let such dangerous technology remain free to be abused by the wrong individuals. Lastly in Death and the Queen (written by James Goss), the Doctor tries to convince soon-to-be-crowned Queen Donna that not all is right in this mysterious land of Goritania. But Donna is determined to push through with her marriage to the new love of her life just as Death himself seems to be knocking on the castle doors. What I Liked: These were all very clever Doctor Who stories that felt very in line with the actual television series. Having David Tennant and Catherine Tate voice their original characters along with the rest of the supporting casts for each story really did a lot to add more flavor to the story and make it feel more than just a story being read aloud. There's a special dynamism that you get when you have a cast of different talent voicing the characters in the stories as it does make it feel more emotionally powerful somehow versus a single narrator. Couple that with some excellent writing that really feels in tune with how these characters were like on the show and the end result is a great collection of adventures. What Could Have Been Better: The relative brevity of these stories even as recorded productions is a little sad at times since the stories can be pretty intriguing and you want them to one for much longer. But that's comparing it to another Audible release instead of a standard episode of the show as each story does run for at least an hour. Catherine Tate sounded a little off in the first story, like she was still trying to get back into character or maybe the recording didn't quite capture the usual tone of her voice. It would come and go within the story but it would nag me at times. TL;DR: Doctor Who: The Tenth Doctor Adventures - Volume One is still a great addition to any Whovian audio library. I hope this means we'll get more Big Finish content on Audible because I'll certainly be investing my credits in these collections. Thus the first volume gets a good 5 moments of the Doctor getting distracted out of a possible 5.